From left, Dominic Au of CHA Canada, Keith Sunderman of Penn State Health, John Moynihan of COGEN Power Technologies, Tim Dunkle of Penn State Health, Gregory Fink of Penn State Health, Patrick Gebbie of COGEN Power Technologies, Kevin Kanoff of Penn State Health, Marvin Smith of Penn State Health, John Daley of COGEN Power Technologies and Heidi Kunka of USGBC Central Pennsylvania celebrate at the Forever Green awards. U.S. Green Building Council (USGBC) Central Pennsylvania recognized Penn State Health Milton S. Hershey Medical Center as the 2018 Climate Champion at the Forever Green awards on Nov. 1. 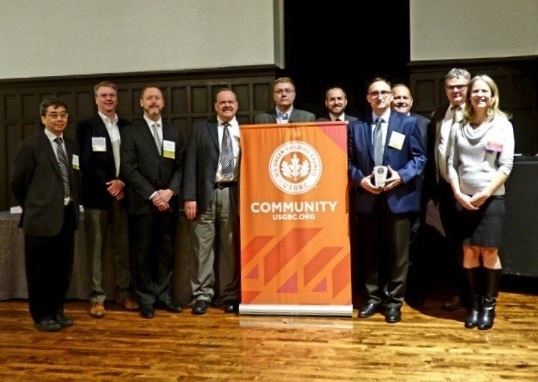 The award was presented for the combined heat and power (CHP) project on the Hershey campus, which reduced campus carbon emissions by 46,000 tons, equivalent to taking 7,551 cars off the road. Located at the southwest corner of the Hershey campus, the natural gas-fired CHP plant generates 60 percent of the electricity and the majority of steam required for climate control, cooking, hot water generation and sterilization of medical equipment. Earlier this month, the new cogeneration plant will begin generating electricity and producing the majority of the campus steam demand. The Hershey campus will move from the traditional system of providing heat and power at approximately 45 percent efficiency to a CHP system at approximately 80 percent efficiency. Hershey Medical Center’s Facilities Department initiated a multiphase energy savings program in 2009 to address sustainability and energy conservation needs. Annual energy costs have decreased from $16 million in 2009 to less than $10 million in 2018. In 2017, a chilled water optimization project targeted the three water chiller plants that cool 2.6 million square feet in the two hospitals, five institutes and Penn State College of Medicine. The chiller project reduced energy output by 24 percent and saves more than $300,000 each year. Marvin Smith, assistant vice president for facilities, noted that all campus building renovations and new construction must be compliant with Leadership in Energy and Environmental Design (LEED) standards. This will include the future Innovation Pavilion, targeted to begin construction in 2019. “The bottom line is if we can maintain and operate our campus in a sustainable, energy-efficient and fiscally sound manner, we will be able to provide better care for our patients,” concluded Smith. USGBC is a nonprofit advocacy organization that promotes sustainability in building design, construction and operation through LEED industry standards. The Forever Green awards are an annual recognition of companies, individuals and institutions that demonstrate exemplary commitment and achievements in creating a more sustainable future.